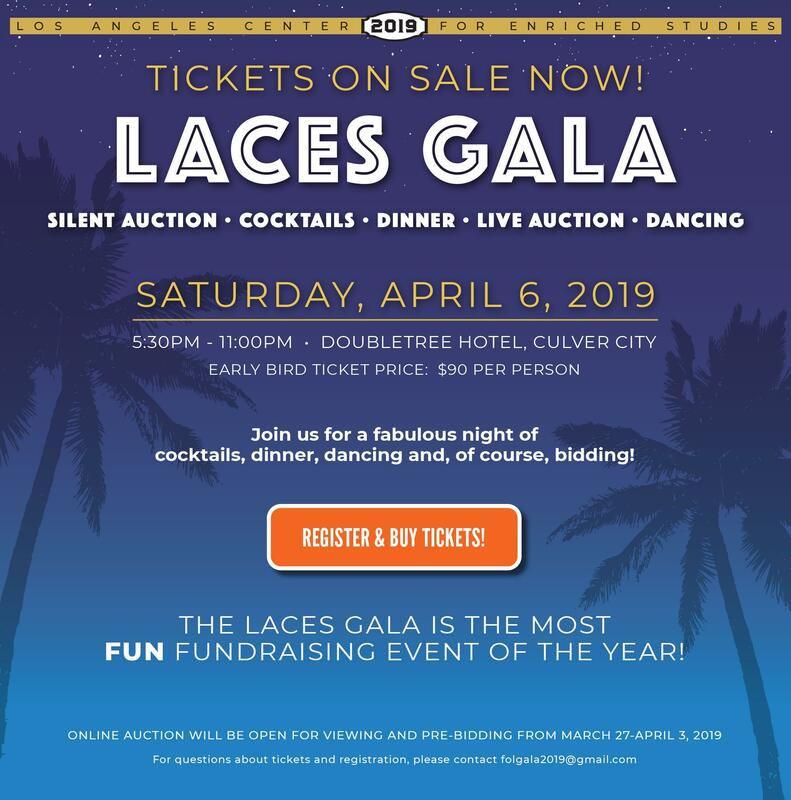 Did you know the Spring Gala is our second biggest fundraiser benefiting LACES? It's a fun, adults-only evening! It is a fun party that is also a fundraiser for FOL and it is held at the beautiful Doubletree Hotel in Culver City. For many parents this is one of the few events they can attend since it is on a Saturday night, is a no pressure, adult only evening that provides ample opportunities to meet other LACES people. What does my ticket cost and what does it include? The early-bird price is $90. The price goes up to $100 as of March 1st. Your ticket includes your entrance fee and a sit down dinner. It's a great deal for dinner, drinks, dancing, and the chance to win some awesome swag. We have not really met other families so where will we sit? You may consider putting your own table of 10 together Do a shout-out on FB or Schoology, you will probably get a table of 10 quickly. What is the deal with auction items? There will be tons of fantastic items for guests to bid on. There will also be live auctions for trips, art and exceptional dinners (plus more). Some of these items will also be available for bidding on line prior to the Gala; all items will be available throughout the evening, right up until we close the auction that night. Where do these auction items come from? You and the rest of our parents! We ask parents to reach out to their favorite restaurant, spa, hotel, pet store, market, sibling who has a business, best friend who has a vacation house, colleague who offers a great service ---we ask if they will please donate to our silent auction. You will be surprised how many businesses say yes (in fact, many businesses have set aside a portion of their inventory to donate to 501(c)3 schools like ours!). Donation forms below. I’ve never asked a business for an auction before, I’m scared. First of all don’t be afraid. This is Los Angeles. We are the second largest city in the country—businesses are asked every day for donations. They are used to your requests and they are used to giving ... and everyone is usually very polite. Also, you can go online and make a request. For example, Sprinkles Cupcakes only accepts online applications. Yes, we already hit them up this year. But take a look online and see what you can find! You will be pleasantly surprised at how fun it is to make someone's day by giving them the chance to give to their community. They will want a letter with our non profit tax it. If you need a copy of the auction letter and form you will find them below. Or you can email Tracy who can send to you. Trabot@ca.rr.com . Tracy will also answer any questions about how donations work. I’m sorry I have a conflict on Saturday, April 6th. What can I do to support the Gala? You can solicit auction items. You can buy a ticket for your favorite teacher. What is Gala Goal this year? $70,000! And we can do it with your help!